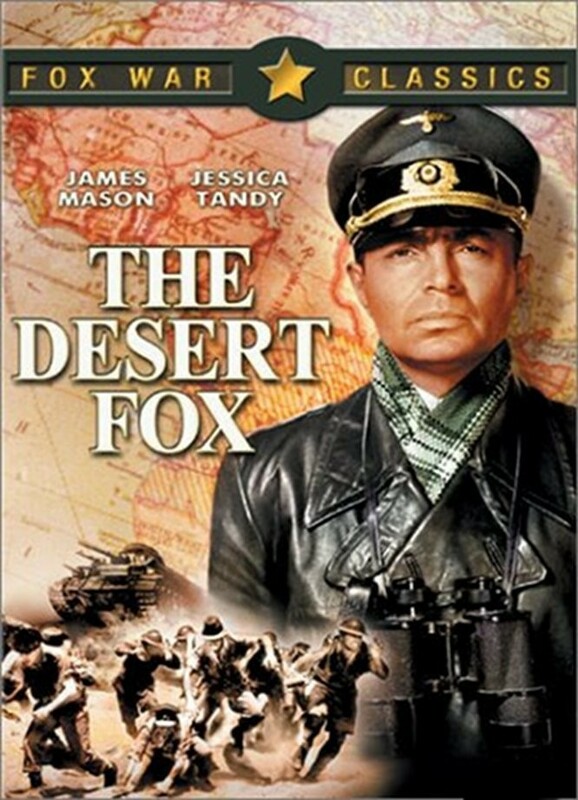 This entry was posted in Movie, Trailer, True Story, War Movie, WWII and tagged Biopic, History, James Mason, Movies, Review, Rommel, War Movie, WWII. That is a coincidence. He’s not a bad actor at all, but I’m sure there are better roles fro him than Field Marshal Rommel. Not a good film indeed. Nevertheless Mason makes sense in the building of the ‘Rommel myth’ in the US/UK/BRD after the war. He would even play Rommel again in The Desert Rats. He’s the ‘good German’, militaristic yet chivalrous, loyal but not fanatic, the one enemy it’s ok to like, or at least respect. And since chivalry and any form of intelligence other than malignant was incompatible with ‘the nazis’, well he ought to be a conflicted character – a specialty of Mason from the 50s on. Quite a change from Erich von Stroheim (who played Rommel in Wilder’s Five Graves to Cairo). It seems the reception was quite controversial, particularly in the UK. While some hated the idea of a likable Wehrmacht marshall, others thought that the nobler the enemy, the greater the victory. Also, the rearmament of West Germany was a hot topic at the time, and this idea that the Wehrmacht wasn’t entirely bad was certainly useful to its supporters – while its opponents, particularly on the far-left, were infuriated. Of course at the same time Stalin was rearming the DDR, but he didn’t need popular movies. PS: I remember reading about a German TV movie a couple of years ago, that intended to debunk the myth. Have you seen it? He’s not bad but that didn’t save the film. I thought the beginning was particularly painful with that action sequence in what looked obvious like cardboard walls and fake trees. I haven’t seen it and not even heard a lot about it. Maybe there really is no great Rommel movie. Yes, that’s the one with Tukur as Rommel. From what I saw it does also just focus on the end when he starts to doubt Hitler. Not sure if it’s worth watching. Earlier parts, such as the admiration for Hitler and the friendship with Goebbels, might be more problematic. It seems his family wasn’t happy about the movie at all… I might give it a try (you’ll be relieved, my Spanish streak has ended). A nice piece (in French) about the filming and release of Desert Fox here: http://bit.ly/1cWNXbl – the letter to Hataway from the French crew hired by Fox is quite something. Thanks, I’ll have a look later. We see in the Dsert Fox that he really admired Hotler until he was let down by him. I actually really plan to do that soon. Just wait and see what the list will bring. Good review. I found it overrated at #78 on the 100 Greatest War Movies list. I have two major problems with it. It is not really a biopic like the much superior “Patton”. Instead it would more appropriately be described as a movie about Rommel’s involvement in the Hitler assassination attempt. On the plus side, it does this very accurately. The other problem is the lack of action. There is very little after the opening scene (which is fictional). It feels like a play for the most part. Rommel deserves a mini-series and the more skeptical attitude of a Pattonesque director. I couldn’t agree more. It’s always called a biopic, so I adopted the term but you’re right, it’s misleading. I’d watch a mini-series and I’mpretty sure there would be enough material. Or at least a movie as good as Patton. I remember it was on the lsit but it’s not deserving its place. Rommel (2012, DE) also deals exclusively with the officer’s last months, between France and Germany. It is however quite different from Hathaway’s movie: far from the beatification, it is instead a story of a man who never stood up. A willing mascot of the nazi regime, he lets the July plotters raise their hopes through evasiveness… In either cases, he won’t get his own hands dirty, but he appears ready to serve – or reap the honors. Up to what point can a high-ranking person in any organization not challenge its purpose and actions, even if he isn’t himself involved in its darkest enterprises? Does the distaste for ‘politics’ make sense when it becomes obvious that the country’s future and the fate of entire populations have become entirely political matters? Is non-committment possible? Whether the film is historically insightful or not when it comes to Rommel himself, I couldn’t say – but its approach is certainly more credible that the 1951 ridiculous hagiography. That said, it’s a long and talkative film with a rather unimaginative cinematography. Tukur does a very good job at portraying doubt and indecision, yet the role doesn’t allow him to display the toughest, commanding side of the character. His Rommel is a broken man, and the film doesn’t really provide a lead as to why – as well as it doesn’t provide food for thought as to his admiration for Hitler. Paths such as contempt from Prussian officers for the middle-class Swabian war hero are left unexplored. Nevertheless, it’s quite watchable thanks to the cast (there are also good performances by Sadler as Speidel – who would later become a NATO forces commander – and Silberschneider as Hitler). PS: I understand why the family was infuriated. But indeed, the Rommel family house in 1943-44 had been a jewish boarding school and afterwards a (forced) jewish retirement home, from which the pensioners were sent to concentration or extermination camps. Time to drop the ‘hero, saint and martyr’ antics. It sounds far more interesting than I would have thought. he does come across as a bit of a marty in the Desert Fox but his indetermination can still be felt. I was not sure when i saw they chose Tukur for this new film. He can be very good but I don’t see him as Rommel either. I totally agree that the film was a disappointment. I don’t think Mason was the problem, but the budget. Fox tried to make the movie on the cheap, and it shows. The script is weak, and the battle scenes are kind of embarrassing. Rommel definitely deserves a proper feature, preferably a miniseries, which are actually starting to come back in the US, with Hatfields and McCoys a couple of years ago, and Bonnie and Clyde coming out this week. Those battle scene were just glued on and the few reenacted ones were cringe-worthy. A mini-series would be very good. A lot to cover when you want to do a life like this any justice. I do agree with all of you that a mini-series could be great, however it wouldn’t be easy at all as one would have to develop a global vision of Germany’s eventful first half of the 20th century. Even when focusing on the imperial-then-republican-then-nazi military it would be quite a task. And I don’t think an American production could deliver anything satisfactory. A German production (or Central European, I’m thinking of Szabó here) would be more sensible. I don’t think an American director would even be interested as I’m not sure the general US public would want to see a mini-series on Rommel. You never know, just my opinion. I think it would be worthwhile but, as you say, it would need a large scope. I’ve seen it. I agree with almost everything you wrote. When they first introduce Rommel I’m seeing a man with some presence to him but Mason could never convince me that he is Rommel. On the subject of Patton as much as I love that movie in real life Patton he sounded more like Elmer Fudd than George C Scott. It’s far from perfect though still stomps Rommel into the ground. I wish they would make a new film about Rommel. If it must be an American production Ed Harris could pull it off though I would prefer it in German. It just seems so wrong to see Rommel not speaking German. Ed Harris wouldn’t make a bad Rommel, I agree, but I’d prefer a German version. It seems that the one nem baj watched isn’t all bad but certainly not THE Rommel movie either. I’m sure Patton has flaws but at least they managed to make us see why he was a great general and why he was controversial.